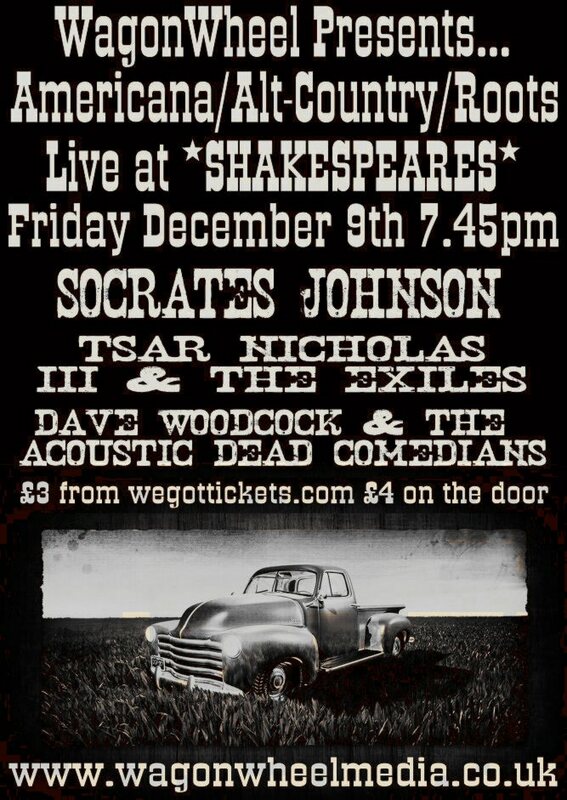 WagonWheel Presents… heads back to Shakespeares on Friday December 9th for a show featuring a fine triple bill of Socrates Johnson, Tsar Nicholas III & The Exiles plus an acoustic performance from Dave Woodcock & The Dead Comedians. Advance tickets for this feast of live music priced at just £3 are available from http://www.wegottickets.com/event/137116 or entry on the night will be £4. Doors open 7.45pm. Sheffield four piece Socrates Johnson, an acoustic bluesy rock n’ roll band, were formed in 2007, originally under the name Troubadour, by Andy Davison and Matt Flowers. Completing the line up are Ewan Asburn on drums/percussion, and Paul Ward on bass who joined in the summer of 2008. In 2008 recording of songs that would make the debut album ‘Providence and Fate’ were completed. Since then they’ve been building their reputation as a quality live act. Tsar Nicholas III & The Exiles rose from the ashes of former Leeds bands ‘The Silver Tree Club’ and ‘Tenderloin’. Frontman Nick Wallace and guitarist Don Mort experimented with different line ups and instrumentation including accordion, eukelele and banjo before settling on the current incarnation. After adding Joel Smith on bass and Danny O’Neil on drums, Joel’s basement became the creative hub of the project, serving as a studio, rehearsal room, pub and padded cell. Out of that melting pot of ideas and personalities came their understated debut album ‘Letter of Marque’. Described by Americana UK as “The next big thing from Sheffield”, Dave Woodcock & The Dead Comedians recently launched their fantastic new album “Poisoned Nights & Bar Room Nights”. They deliver booze soaked rock ‘n’ roll echoing Springsteen, Strummer and with a nod towards the likes of The Hold Steady. Tonight they’ll perform an acoustic set.